Line striping optimizes traffic flow and can maximize the amount of parking. It makes your customers and property safe with a good flowing traffic pattern. We can do anything from a new layout, handicaps, to arrows. Give us a call today. 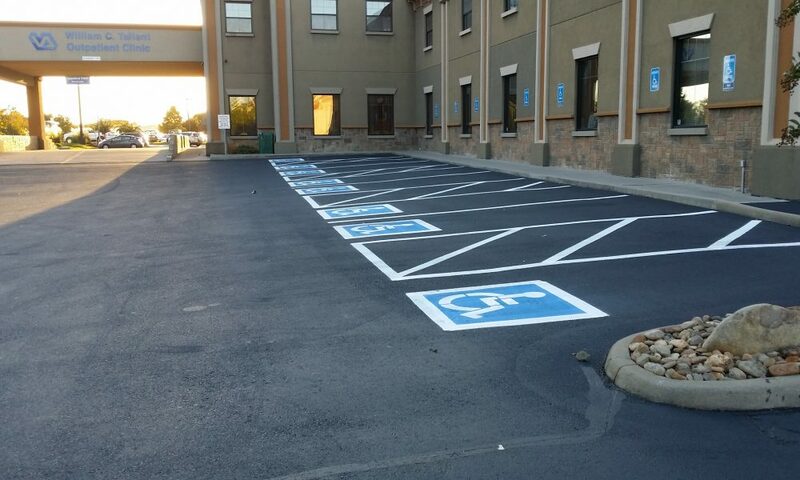 Knox Asphalt Maintenance offers Americans with Disabilities Act (ADA) code compliant line striping & signage. Code compliance varies often by municipalities. We can evaluate and assist you with all of your ADA code compliance needs for your parking lots. Parking lot signs are an easy and convenient way to improve traffic flow, designate parking spaces and areas and help keep traffic moving in the right direction. Knox Asphalt Maintenance can install any sign you need for your parking lot.